The trade in books grew from the system of barter between monasteries and the fledgling Universities, which in the Middle Ages were the two primary producers and consumers of books. In England, early booksellers were called Stationers, after their stalls (or stations), working from a fixed location, as opposed to being itinerant sellers. When the Corporation of London approved the formation of the Guild of Stationers (now the Worshipful Company of Stationers and Newspaper Makers) in 1403, many of the members sold were based around St Paul’s Cathedral. Guilds were established to protect the interests of and to regulate specific trades. Members were tradesmen: they sold writing materials, or specialised in certain areas of book production, such as copying the text, illumination, or binding. From the 15th century, the adoption of paper and the printing press were making book production considerably easier, and was the first major change that the relatively-young industry faced. Daniel Midwinter was a prominent bookseller, one of several based at St Paul’s Cathedral in London. Early religious booksellers published either Anglican or Dissenting books. This letter concerning 226 orders for alterations in common prayers to be distributed within York diocese. It was retained within the papers of the Archdeaconry Court, which had responsibility for ensuring all parishes had the correct ecclesiastical books available. Literacy rates are notoriously difficult to calculate, but up until the introduction of compulsory education in 1870 it seems likely that about 30-40% of the population could read. Most probably didn’t, except for newspapers and chapbooks, which were cheap pamphlets of folktales, ballads, or political and religious tracts. Books were a status symbol and beyond the financial means of a significant portion of the population. Buyer beware! 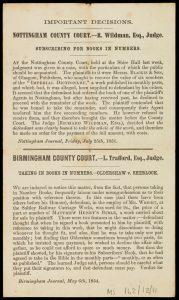 This printed sheet gives information about two cases in Nottingham and Birmingham where defendants were judged to be obliged to continue with a series publications to which they had subscribed. At least one of the booksellers involved, Blackie & Sons, primarily sold serial publications to subscribers, rather than individual books, which is why they were motivated to take legal action. 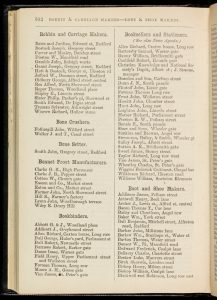 Trade directories show towns that had a thriving book trade. In 1862, Nottingham had over two dozen booksellers. Trade directories were issued from the mid-18th century until the 1940s. Businesses, tradesmen, and (depending on the type of directory) the wealthier private residents could have their names and addresses printed, for a fee, and therefore be more easily found by the public and potential customers. Booksellers also operated as bookbinders, stationers and newsagents, printing a wide range of materials such as visiting cards and photograph albums. The Derry family were one of the Nottingham-based printers and bookbinders. John Derry (1792-1869) began a career in the army and saw action with the King’s Dragoon Guards at Waterloo. After being discharged from the army, he became a warehouseman, agent and bookseller. 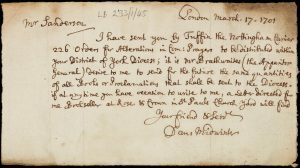 This draft agreement shows the beginning of his career in the book trade, as a warehouseman in Leicester. 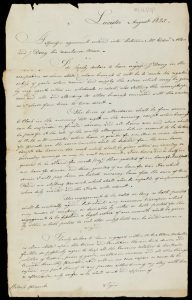 Hours of work were 7am to 8pm, with 2 ½ hours for meal breaks, and duties included “making entrys [sic] of goods when received and supply the orders…settling the accompts [accounts]….and attending to other business connected with the warehouse”. His fourth son, Joseph Derry (1835-1910), founded the Nottingham-based printing and bookbinding firm of Derry’s. Books were popular gifts for Christmas and New Year, and booksellers would ensure their subscribers received a catalogue of books available. The books listed alphabetically here are a mixture of factual, fiction, adults and children’s. In contrast to today’s book promotions, there are scarcely any details about what a book may be about or references to similar works that may assist the potential purchaser. There are several books relating to Nottingham including one by local author Mary Howitt. 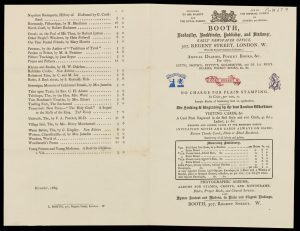 Booth also printed a variety of stationery, and the different fonts on the front are designed to show the range that could be offered. The records relating to booksellers are from the collections of Manuscripts and Special Collections at the University of Nottingham and can be viewed in our Reading Room. Our most recent exhibition, ‘Collected Words: from the Literary Collections at the University of Nottingham‘, celebrates Nottingham’s recognition as a UNESCO City of Literature. ‘Collected Words’ is on at the Weston Gallery, Nottingham Lakeside Arts until 3 December 2017.